It's time. That's what McKay's little body said very clearly to his cardiologist today. It's time to move forward. It's time to begin to fix what's broken. It's time to get uncomfortable again. The appointment began with a routine check of McKay's sats. 71-68-69-70-68-68-68. His O2 level bounced around a bit, but stayed solidly in the unacceptable zone. They normally like to check levels with and without artificial oxygen support, but it was clear there would be no need to see him dip any further. He was weighed: 13 pounds 11 ounces. Wow. And measured: 24 1/4 inches. Double-wow. Mac's doc then proceeded to listen very closely to his chest. She listened and listened and listened. 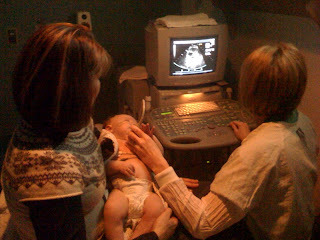 Apparently his shunt, which used to sound a very clear "swoosh, swoosh," inside his tiny chest is getting harder to hear. The increased hush motivated an impromptu echo cardiogram today to see if his shunt or pulmonary artery had developed any kinks that would slow flow to the lungs. They usually sedate infants for echos because it requires a steady ultrasound of their heart which means the tech has to gel and scope the area immediately at the base of their tiny necks. Not fun. Lots of wild crying. McKay started out as you would expect and rejected all attempts at baiting him with a sugared-up binky. But once I picked him up, he fell almost immediately asleep and continued to dream of better days through the entire procedure. They got great pics of his plumbing and were able to rule out kinks as the cause of McKay's lack of oxygen. However it was clear his shunt is narrowing, constricting the small bridge of blood flow to his lungs it was meant to create. All in all, as the shunt narrows and McKay grows, it becomes increasingly clear a bigger, more permanent fix is in order. McKay's cardiologists and the heart surgeons pow-wowed this afternoon to determine the best way to prepare for McKay's Glenn operation. Once they've made their decisions, the phone calls will begin. So far we've been contacted to schedule an MRI and sedated echo for later this week. We expect a call tomorrow with a definite date for his Glenn which we've been told will be in the next week or two. We wish you the best and hope that all goes well. Please call if you need anything! You will remain in our prayers! Oh Matt and Mindi--I don't know what to say, except for that I'm sending along all my faith and trust. We are praying for you and love you all! I want to help out in anyway that I can! You are so strong and McKay is a strong little guy. I have faith that everything will be good. PLEASE let me know what I can do for you. Mindi and Family, You are all in my thoughts daily and in my prayers! I wish you all the strength and health to get you through this next big step for adorable little McKay! Sending our prayers, peace, love, understanding and spoonfuls of goodness for the Cox clan of the brave and mighty Mindi and her powerful boy. Wow, that came fast, didn't it? Hang in there. You have so much strength. Both you and Matt do, along with that gorgeous, tough little guy. Thanks for keeping us updated. I want to see you guys so bad but have had kids with stuffy noses and coughs, and I am not coming anywhere near that sweet baby until everyone around me is well. I think I will just give your gift to Linda and she can get it to you. Love to all of you. We are praying for you guys. We are cheering you on from the east coast! I am so sorry I've been out of touch; the days are passing much too quickly! McKay is beautiful and strong. We are keeping you all in our prayers. As always, you will be in our thoughts and prayers. With Thanksgiving approaching I have been q2thinking a lot about all the things I am thankful for. What a little blessing McKay has been in your life and in ours. Through his trial and example, we have all learned to step back and evaluate what is really important. Every moment of every day is precious and I a thank you for reminding us of this on a regular basis! You are all SO loved!! We love you and will be waiting for the updates. Sorry about the previous post..Bronson was helping me type! Mindi, We are thinking of you and all your boys. We are praying that all will go well and little McKay will lead a very healthy life! We send all of our love and you are all in our prayers. Please let us know if there is anything we can do.